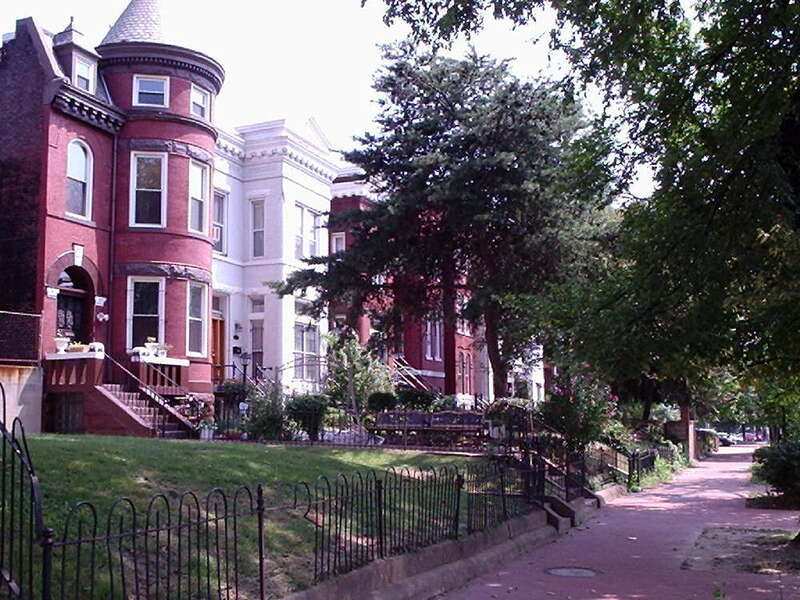 Rowhouses, also called townhouses, are sets of similar, adjoined homes that share a common wall and sidewalk, with a direct connection to the sidewalk. They frequently have a diversity in design features and paint color to provide interest and uniqueness, two to three stories tall, and are usually owner-occupied. 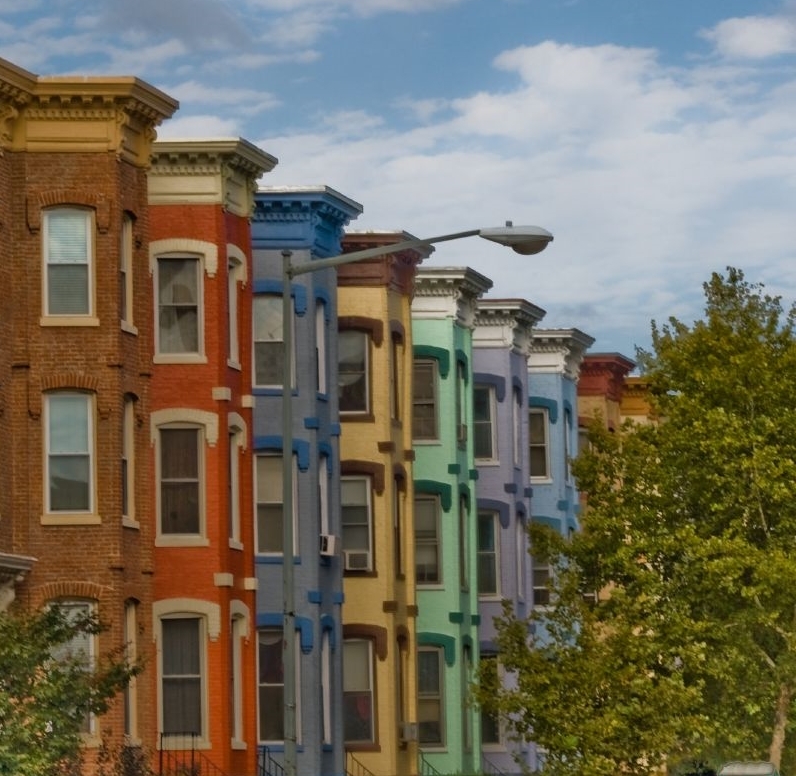 Rowhouses come in groups of three-to-seven houses in a row. Rowhouses typically have small front and back yards-- the South Willamette Special Area Zone code mandates that rowhouses have at least 400 square feet of private open space. Despite the fact townhouse and rowhouses make up the backbone of many traditional urban neighborhoods, they are very restricted in current Eugene code-- they are prohibited entirely from several neighborhoods and the ability to build a rowhouse neighborhood or block is very limited. 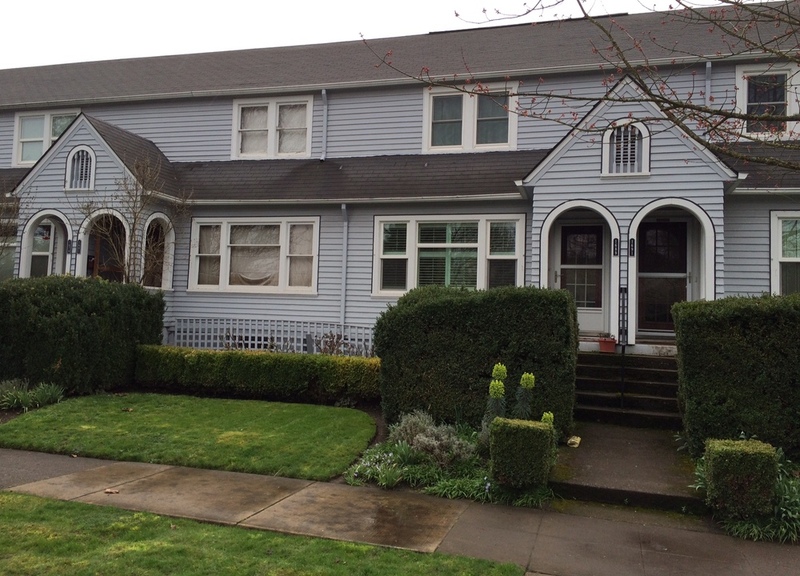 Rowhouses are further defined in the South Willamette Special Area Zone (SWSAZ) code. Narrow houses basically small single family detached homes. They could be structured as detached rowhouses, but also as bungalows or cottages. Narrow houses are a new housing type to the SWSAZ code. Rowhouses and Narrow Houses are especially appealing to smaller households who would like to own their own home and have some outdoor space, but don't want to maintain a large yard-- they are an excellent middle option between a detached single-family home and a condo in a multi-unit building. 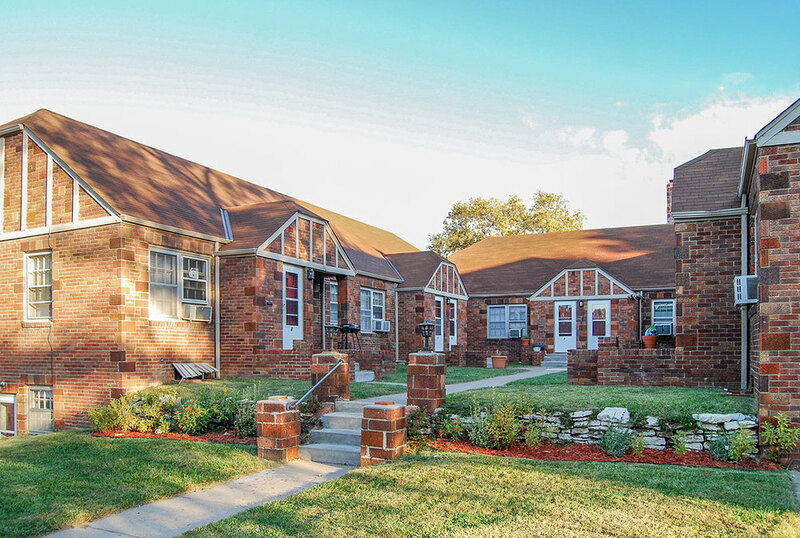 Courtyard Housing refers to groups of 2-6 one-family units, either attached or detached, that center upon a common open space. Unlike rowhouse and narrow houses, which have front entrances facing the street, courtyard houses address a courtyard that itself connects into the street. The shared courtyard provides residents with access to open space with a more urban form than typical single-family homes. To some degree, they represent a middle ground between rowhouses, which have no requirement for common open space but can be larger homes, and cottage clusters in which smaller homes share open space. While many apartments in Eugene have the basic structure of courtyard apartments, they frequently face onto parking lots rather than true courtyards, and courtyard homes are a grouping of single-family homes as opposed to a multi-unit apartment buildings. With the SWSAZ, courtyard housing would be a newly defined housing type in Eugene. Cottage Clusters are a group of small, detached homes clustered around a central outdoor common space. Some of the homes face the open common space, while those on the street face the street. Cottages in the cluster are small-- the maximum square footage allowed by the SWSAZ code is 850 square feet on a ground floor and 1000 square feet total. Each is considered a single home with its own small yard and covered porch, though they also share a central outdoor common space. With the South Willamette Special Area Zone (SWSAZ), cottage clusters would be a newly defined housing type in Eugene. Cottages are ideal for individuals and couples who don't want a lot of space, but would still enjoy some private outdoor space to maintain a small garden or patio area. Twins are two attached homes. They can be configured as traditional duplexes (where two homes are attached side-by-side and share a common wall) or configured as an upstairs/downstairs unit, or front/back unit. Twins are ideal for converting a larger house into two smaller homes, one of which can be rented out or sold for extra income for the primary home owner or provide living space for family members who want to be close by but also want their own private home. Secondary Dwelling Units (or Accessory Dwelling Units) are a second small dwelling on the same lot as a single family home. It might be an apartment over the garage, a detached small cottage on its own foundation, a basement apartment, etc. Zoning regulations restrict the height and locations of secondary units to minimize their impact on neighboring homes. Secondary Units can help make a home more affordable, since the rental income helps the homeowner pay mortgage costs. They can also serve families, either as additional space when a family grows or to accommodate extended family (i.e. in-law units.) 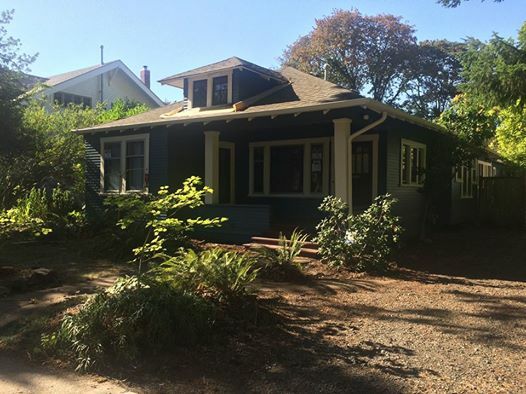 Secondary dwelling units are perhaps the most common type of non-traditional housing in Eugene. Detached single family homes are what we traditionally think of when we think of a house-- they are a home intended for one household, one or two stories tall, on its own lot with a yard. 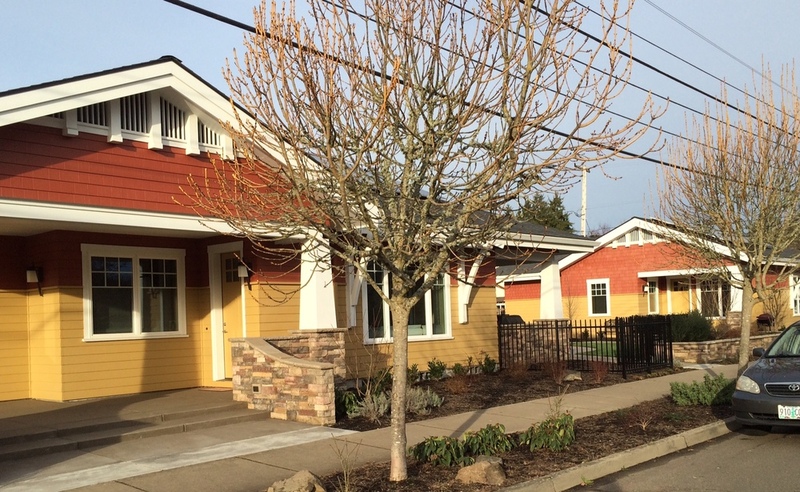 This is the most common type of housing in Eugene, with over 60% of our housing in the form of single family homes. Detached single-family homes are great for families, particularly those who would like yards for kids to play in. In Eugene, they are also frequently rented out to groups of roommates. Apartments and condominiums are homes where multiple units are contained within the same building. They come in a large variety of types: a large house that has been subdivided into two or more apartments, an old school that has been converted into condos, a moderately sized courtyard style complex, or a high-rise apartment building. Apartment/condo buildings can be structured so that each unit opens into a central hallway (as is common with larger apartment buildings) or where some or all units open directly to the outside (common in smaller apartments and courtyard complexes.) About 10% of Eugene's housing is in the form of small apartment/condo buildings (2-4 units), and another 23% of our housing stock is in the form of larger apartment/condo buildings (five or more units.) In apartments, the building owner is typically responsible for all maintenance; in condos, the owner is typically responsible for maintenance in the individual unit, but overall building and grounds maintenance is shared between the unit owners. Condos are ideal for people who would like the financial security and flexibility of owning a home without all of the maintenance requirements that come from a single-family option. In the South Willamette Special Area Zone code, particular areas that are zoned for apartments and condos are required to create buildings with a "Rowhouse Character." This means that the buildings must be designed in such a way that the exterior mimics rowhouses, with entrances at least every 30 feet. "Rowhouse character required" buildings helps apartment/condo buildings integrate more smoothly with nearby residential dwellings of other types.